“Uzbekistan’s rapid rapprochement with Russia, heard in the voice of Islam Karimov meeting with the Russian president Putin and defense minister Ivanov, has delivered some of the initial tangible results. According to Fergana’s credible sources, in the nearest future Uzbekistan is going to sign some serious bilateral documents capable of impacting the geopolitical situation within the region”. Please don’t be surprised: this is not today’s news about Moscow and Tashkent. Actually, that was the lead to a news story published on Fergana.ru exactly 7 years ago, in June 30, 2005. As a matter of fact that happened at the time of Putin’s first rapprochement with Islam Karimov. The Uzbek president criticized by its western partners for shooting protesters during the bloody Andizhon events had rushed to Moscow for support (the original publication described the meeting of Putin and Karimov in Novo-Ogarevo, and statements made by the two leaders that appeared to be confident of their eternal friendship). Uzbek president did most of the talking during the press-conference for journalists. He spent a lot of time threatening the media with Islamic terrorism aiming to destroy Uzbekistan and subsequently the rest of the world, rejected the very idea of an international investigation of the Andizhon events, color revolutions and growing influence of NATO in the east. Both leaders agreed that riot in Andizhon had been inspired from Afghanistan for terrorists were “led by those who had used the religious extremist and radical forces fought against in Afghanistan and Iraq today”, as put by Islam Karimov. Thus trying to hit the West, Karimov manifested his loyalty to Moscow, seeking to hide under its umbrella in order to protect his power in Uzbekistan from any outside influence and inside rebellion. In about a year after that Tashkent had regained its membership with the CSTO. However, a couple of years after, it became clear that Uzbekistan’s membership was intended to remain formal only: it has never ratified any of the CSTO international agreements and abstained from joint military exercises. This dead-alive membership of Uzbekistan in this Russian-led military bloc has come to its logical conclusion as Uzbekistan has announced it terminated in June 2012. In order to understand why Uzbekistan has, for the second time, quit the CSTO, one has to recall why it had already withdrawn from the organization once in 1999. The CSTO (formerly just Collective Security Treaty or CST) was signed in 1992 and made effective in 1994 to bring together over half of the former Soviet republics, including Armenia, Kazakhstan, Kyrgyzstan, Russian, Tajikistan, Uzbekistan, Azerbaijan, Georgia and Belarus. At an early stage, it was not a real organization but rather just an agreement put on paper allowing the signatory states to keep on watching each other for as long as they wished. Five years later it was clear that the original signatories were on different tracks. As a result, in 1999, five countries including Azerbaijan, Georgia, Moldavia, Ukraine and Uzbekistan broke up with the CST and created a bloc of their own (GUUAM). The new organization appeared quite fragile too. Logically, it was a purely regional-scale entity that brought together the countries of the Caspian and Black seas, where Uzbekistan did not really belong. Joining the union, Karimov was looking to the West and NATO, rather than Ukraine and Moldova, taking this club of few countries as a bridge to reach Europe. Growing disappointed with ageing Eltsin and economically unstable Russia, Islam Karimov counted greatly upon partnership with the successful West, regarding it as the source of security and likely investments. Karimov kept on praising the NATO and the United States even stronger in early 2000, in the beginning of anti-Taliban operations in Afghanistan. In April 2002, the president of Uzbekistan made a statement that the United States had done more for his country than partners from CIS: “Only the United States with its determination and well-equipped armed forces have played the key role in reducing the tension and removing threats at the southern border of Uzbekistan, rather than the participants of the collective security treaty”, Karimov said. Soon, however, the bridge fell down: Uzbekistan was ignoring activities of this organization and finally left it in May 2005, in fear of “color revolutions” which swept over Georgia and Ukraine two years before that. Thus, Kraimov had used the West in general, and the United States and NATO, in particular, for as long as they refrained from interfering into his private matters and until they developed a threat to his regime. “We can be friends unless you start talking about human rights and political reforms”, was the key message from Tashkent to the democratic westerners. Its message to Russia and Kremlin-driven blocs was quite different though: “Give me more money but stay away with you comrade’s hugs”. Indeed, nor SCO neither CSTO possess any direct threat to the regime of Islam Karimov. However, their members, especially from the Central Asia, have more problems with each other than common development and cooperation goals. Uzbekistan has found itself in the very heart of this tangle of contradictions as its autocratic leader is not capable of making any multilateral compromises. This is why, the official Tashkent accounts for its withdrawal from the bloc as “switching accents over to bilateral contacts with partners”. While other attentive observers find a lot of benefits in Karimov’s break up with the CSTO. Switching away from an integration-based model to the ‘bilateral contacts” means that Uzbekistan is desperate to get rid of its obligations in the bloc and take up issues with its neighbors separately, one by one. The largest problem for Tashkent, is of course, Dushanbe, which remains a member of the CSTO. “The tension between Uzbekistan and Tajikistan reminds one of the Cold war”, said the late Sanobar Shermatova back in 2008, “pushing Moscow to find ways for bringing the neighbors closer”. Apparently, the Moscow had no luck. Perhaps it was looking in the wrong direction, or maybe it was too naпve expecting the president of Uzbekistan accept all of its initiatives after the Andizhon massacre. Also maybe, integration model simply does not work in the post-soviet political system in the Central Asia with its typical autocratic and selfish rulers. Back in 2004, Sanobar Shermatova made another accurate observation: “Relations between states in the CIS are extremely dependent on the presidents’ personalities: if you fail to make friends with a country’s leader, don’t expect an understanding between your countries. Islam Karimov is exactly a person who can hardly come to terms with other countries’ leaders. Now that the NATO needs Uzbekistan badly, Karimov takes advantage of the situation in order to strengthen his own personal standing vs. neighbors. This launches a new stage of Tashkent’s alienation from its partners within CIS and rapprochement with the so called “West”. Today, the United States and Europe are no longer criticizing Uzbekistan for its authoritarian regime. Instead, they have promised support to Karimov and even guaranteed to keep his political regime. This attitude from the West is a lot more attractive for the Uzbek dictator that the policy of Kremlin pursuing the Eurasian integration which frightens off some of the too independent neighbors. In other words, the conditional West which only recently pretended to change the Central Asian khan Karimov, teach him some democracy, including political competition and open society, has now completely reviewed its strategy, by claiming “non-interference into the country’s internal matters”. 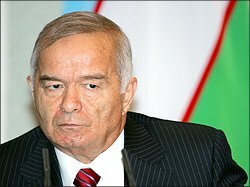 By doing this, the West and the States, which have finally forgotten of endless human rights violations and dictatorship of Islam Karimov in a faraway Central Asian state, have grown much more likeable for Islam Karimov than the new imperial policy of Putin’s Kremlin taking step by step to subdue the former soviet provinces. This, however, does not necessarily means a break up between Tashkent and Moscow, at least until “the dear Vladimir Vladimirovich” remains in Kremlin. Uzbekistan’s withdrawal from CSTO is a manifestation of another failed attempt to lure Islam Karimov into a security club driven by Moscow. It also means that relationship of Uzbekistan, Russia, CSTO and the conditional West have now returned to where it used to be some 10 years ago, in 2002.